Utah is a great state for nature lovers and apparently that may make us all a bit more creative. The idea behind the result is that modern life taxes up an excessive amount of our attention. Ringing cell phones, computer notifications, sirens, cars and the like all distract us from a particular task we are trying to accomplish and force our brains to focus on them. It’s these sudden events that tend to drain our “executive attentional system,” [U. psychology professor David] Strayer said. The best thing about these findings is that in Utah, and especially Provo, it’s really easy to get out into nature. From my house, for example, I can bike to several backpacking trails that can start a days-long adventure in the wilderness. If I drive, there are dozens of other nature opportunities near by. In many places that wouldn’t be possible at all, and few locations in the U.S. have as dramatic and accessible outdoor scenery as Provo. In addition to hiking trails, Provo also has a large lake. Save a piece of country like that intact, and it does not matter in the slightest that only a few people every year will go into it. That is precisely its value. Roads would be a desecration, crowds would ruin it. But those who haven’t the strength or youth to go into it and live can simply sit and look. They can look two hundred miles, clear into Colorado: and looking down over the cliffs and canyons of the San Rafael Swell and the Robbers’ Roost they can also look as deeply into themselves as anywhere I know. And if they can’t even get to the places on the Aquarius Plateau where the present roads will carry them, they can simply contemplate the idea, take pleasure in the fact that such a timeless and uncontrolled part of earth is still there. These are some of the things wilderness can do for us. That is the reason we need to put into effect, for its preservation, some other principle that the principles of exploitation or “usefulness” or even recreation. We simply need that wild country available to us, even if we never do more than drive to its edge and look in. For it can be a means of reassuring ourselves of our sanity as creatures, a part of the geography of hope. Stegner’s argument is more abstract than a scientific study, and his objective is somewhat different, but both point to the importance of natural landscapes. 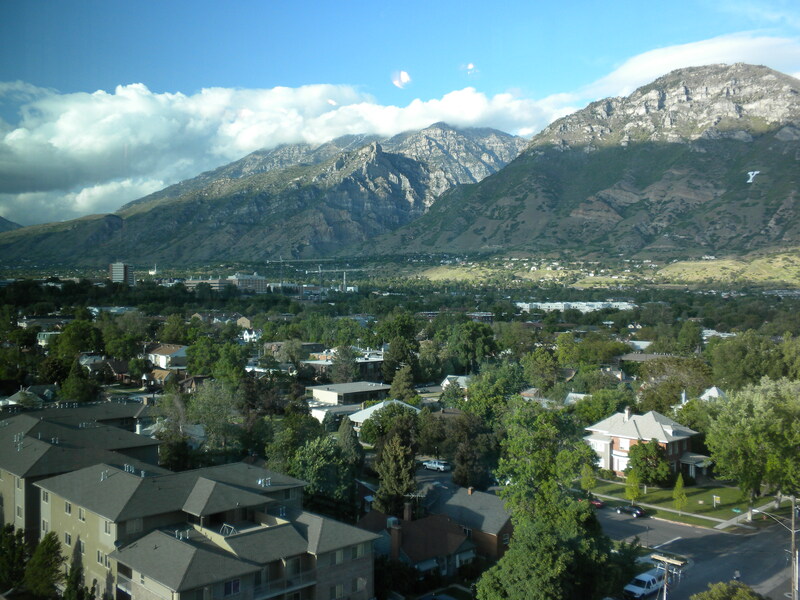 And in Provo, those landscapes are particularly proximate to our homes. A plaque on the Provo River Trail. Should Our Cities Ban Harmful Things? Way back in May I mentioned that L.A. had just made history by becoming the largest U.S. city to ban plastic grocery bags. But Provo is a lot smaller than L.A., so does it really matter if a medium-sized city outlaws harmful pollutants? A recent Atlantic Cities article seems to think so. The article details how a Massachusetts town recently banned styrofoam takeout containers. The town is less than half the size of Provo, but the author ultimately comes to the conclusion that such efforts might be useful because they can spill over into neighboring communities and because they are symbolic. And of course, they also have a small actual impact on the environment. Recycling cans are becoming just as common as garbage cans in Provo. That makes a positive difference in many ways. To that I would add that less harmful waste in local landfills actually saves money. A local example of these phenomena is glass recycling. In July I noted that Salt Lake City is recycling glass and wondered when Provo would do the same. 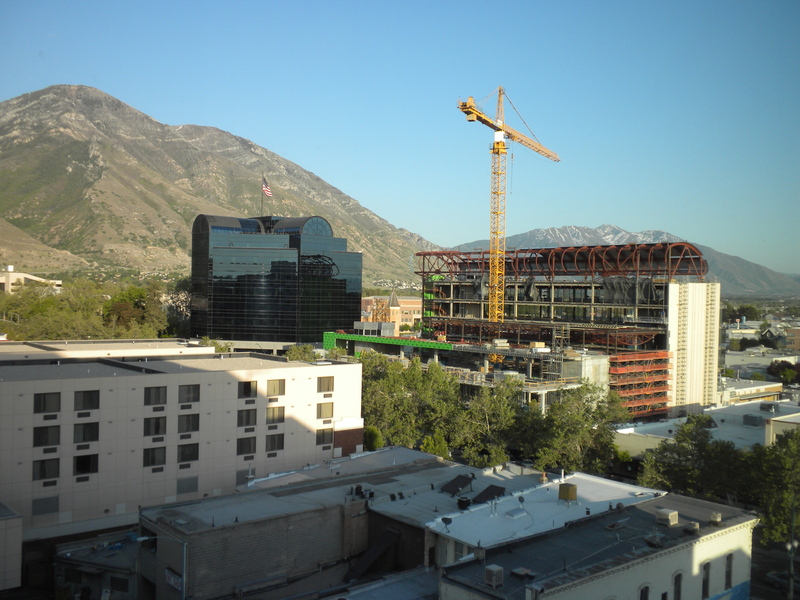 Six months later, Provo has followed the example of its neighbor to the north and is now working on it. The point here is that small changes do make a difference. 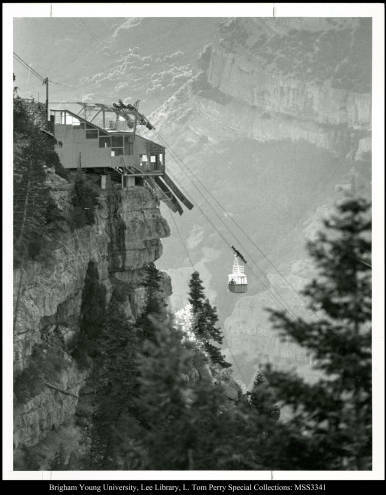 Here’s a wild, long-shot of an idea: Provo should bring back the gondola over Bridal Veil Falls. 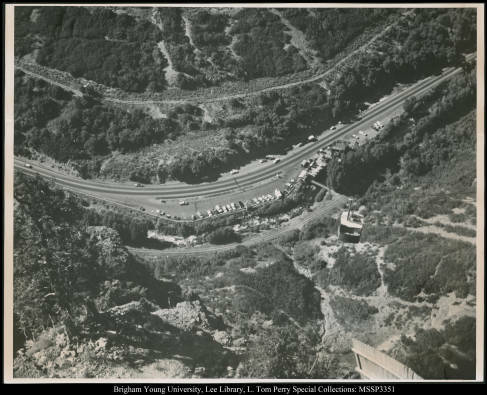 This dramatic shot shows Provo Canyon’s gondola nearly reaching its destination. According to BYU’s archive, it comes from the Daily Herald and was taken sometime between 1960 and 1980. The date and source of this picture are the same as the one above. Note how happy these people are. That’s how we’d all feel all the time if this gondola was rebuilt. The BYU archive states that this picture was taken sometime before 1970. Though hard to see, I think the gondola looks a bit different from those in the first two pictures, suggesting that it may be from before the first collapse. Another kind of cable car. This picture was taken before 1980. 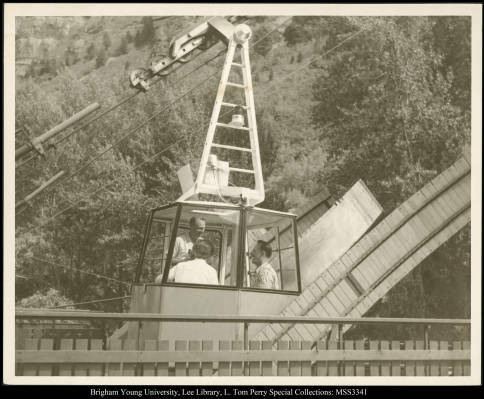 I had the pleasure of riding this gondola as a child during one of my family’s many summer trips to Provo. Much like the people in the pictures above, it brought me great happiness. 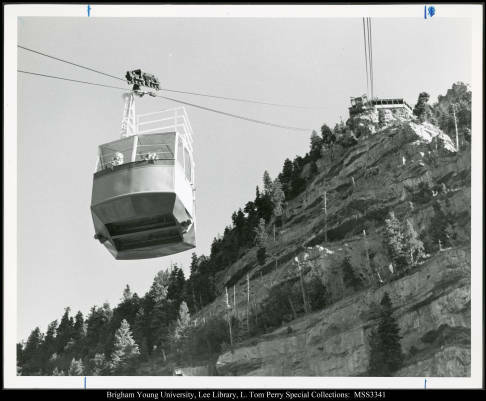 But joy isn’t the only reason to bring the gondola back to Provo Canyon. In fact the Guardian recently reported that this sort of device can be a legitimate form of transportation. 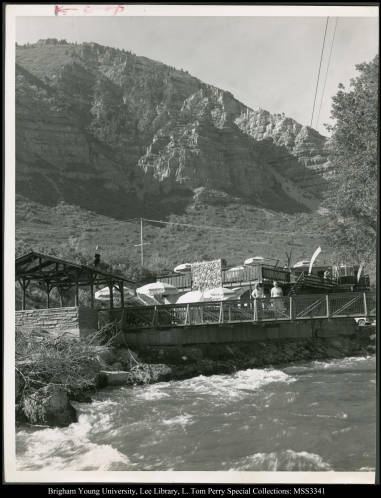 That was certainly the case in Provo, when it was the exclusive way to access the restaurant above Bridal Veil Falls. Presumably then, bringing the gondola back would open up the area above Bridal Veil Falls to new development — meaning perhaps more trails or a restaurant. And speaking of the outdoors, I’ve written before that outdoor activity can be a significant driver of economic development. 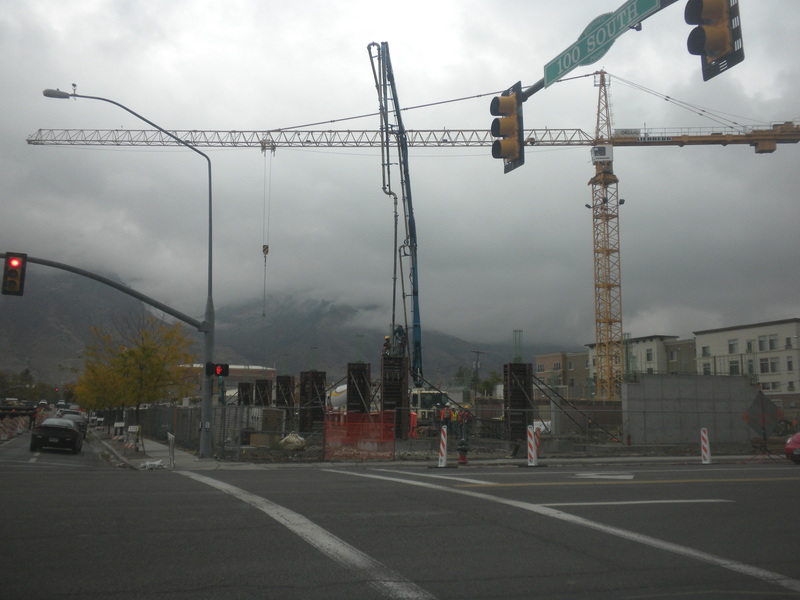 Bringing back the gondola would help Provo further capitalize on its incredible natural environment. It’s also worth noting that the population — meaning the potential customer base for the gondola — in Utah County has dramatically increased in the past 16 years. That increase is projected to continue as well. This is an idea for which the time may finally have arrived. It’s also good for the public pocketbook in many ways. First, when trash trucks take garbage away to dump, the city pays a per-ton landfill fee. Provo paid $135,000 less in fees this year, because recycling diverted nearly 1,500 tons of trash. But that is not the best benefit, the mayor said. Because opt-out recycling removed 5 percent of Provo’s trash last year, the life of the landfill is extended, which will save taxpayers millions over time. The life of the landfill also is extended by the city’s green waste program, which takes grass and yard clippings and turns them into compost, instead of filling the landfill with them. “Now you are talking millions and millions of dollars, and that is where the real savings is,” he said. Those savings will directly and indirectly benefit residents as they’re passed on in the form of public programs, less debt and possibly lower taxes over the long term. A traditional black garbage can along side a newer, blue recycling trash can. Provo’s recycling program is saving the city a lot of money. The article goes on to state that after Provo switched to an opt-in recycling program — which automatically enrolls residents — it saw a 250 percent increase in participation. It also mentions that Provo is trying to figure out how to do glass recycling, which is something I called for here. The overall message here is that recycling is as good for the pocket book as it is for the environment. 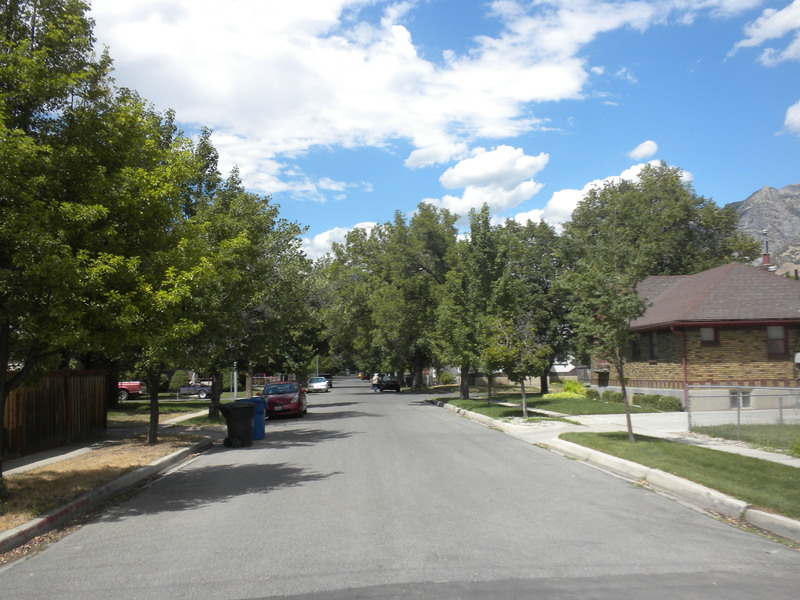 More often than not, Orem shows up on this blog as an example of a city-related problem — dying malls, over-wide streets, etc. — but today Provo’s neighbor to the north is leading the way with greener garbage trucks. The natural gas trucks will be the largest fleet operating in Utah. The trucks collect solid waste and recycling garbage. The trucks put out up to 50 percent less nitrogen oxide, which forms smog, and 25 percent less greenhouse gas. They also run 50 percent quieter than diesel trucks. Utah Valley could definitely use less air pollution, particularly as we head into inversion season, so it’s great to see a larger city proactively working for better environmental stewardship. This development also offers an example for other area cities looking to be more responsible themselves. Can a project be environmentally friendly and invest in parking at the same time? Michael Burton, a sustainable transportation activist who co-founded Chicago’s Critical Mass ride, is less measured in his critique. “A green parking structure!” he emails. “What’s next, a LEED-certified strip mine? Any infrastructure that encourages private automobile use instead of rapid transit, walking and/or biking is inherently environmentally unfriendly. Using green technology to market a new parking structure is simply cynical greenwashing. Greenfield’s example is useful for pointing out the fundamental contradictions in many projects that tout their green credentials while simultaneously relying on cars and car commutes. Construction on Nu Skin’s new parking structure. It’s also worth noting that this parking structure is five blocks, or less than half a mile, from the new commuter rail and bus station. It’s surrounded by the most walkable area in Utah Valley. And Nu Skin is just one of the culprits. Similar criticisms apply to the Utah Valley Convention Center and some of BYU’s development, just to name a few recent examples. The point here is that erecting environmentally friendly buildings is only part of the battle. It’s a great part and companies like Nu Skin should be commended for trying, but buildings ultimately account for a minority of our energy consumption and carbon emissions. A much more important issue is how workers commute to and from the office. In other words, being green also means not building parking structures. As a result, calling structures with big parking lots and car orientations “green” is misleading at best. At worst, it’s deceptive and entirely misses the point of environmental stewardship.